I was clearing out my fridge a few weeks ago and came across a selection of root vegetables lurking there, waiting to be turned into something tasty. The first thing that came to my mind was soup, and since we were in the middle of winter I was thinking along the lines of a chunky, meaty broth. I decided on Chicken, which would provide my soup with both the chunky meat component and the stock. A bunch of fresh coriander which also happened to be in my fridge could be involved here in some way, I thought. I remembered a Madhur Jaffrey recipe for coriander chicken curry, involving large quantities of fresh coriander, resulting in a vibrant green curry sauce. It was fantastic, and so I reckoned it could work in my soup too. The earthiness of all those root vegetables would be balanced by the fresh zing of the coriander. I prepared the chicken in my usual way; removed the breasts, then cut up the remaining carcass into small pieces and fried until nicely caramelised for the stock. This time I actually chopped up the wings and legs too and added them to the stock for extra flavour. Once the stock was almost ready, after an hour or so, I took some out to gently poach the breast meat in a separate pan. Once perfectly barely cooked, I allowed them to cool before carefully cutting them into dice. All the vegetables and chicken diced to the same size, making for an attractive looking bowl of broth. Sprinkle the guinea fowl legs in sea salt and cracked black pepper and place in the fridge overnight, or 8 hours. Rinse the salt off, then place in a pot just big enough to fit them in snugly. Add the duck fat, and cook gently for about 1 hour, or until the legs are tender. Transfer to a container, pour the fat over and refrigerate. Leave for at least one week for the flavours to mature, or up to 2 months. The confit will keep for a long time preserved like this. To make the lentils; finely dice the onion and fry gently in olive oil with a pinch of salt until soft. Rinse the lentils under cold water, then add to the pot along with the bay leaf and thyme. Add just enough chicken stock to cover, bring to the boil, then simmer for about 20 minutes until the lentils are tender. Meanwhile, cut the bacon into lardons, and peel and dice the carrot, celeriac and swede into 5mm dice. In a frying pan, cook the lardons in olive oil until crisp, then add the diced vegetables. Turn the heat down, add a pinch of salt and sweat until the veg is tender. Set aside. Heat the oven to 180C. 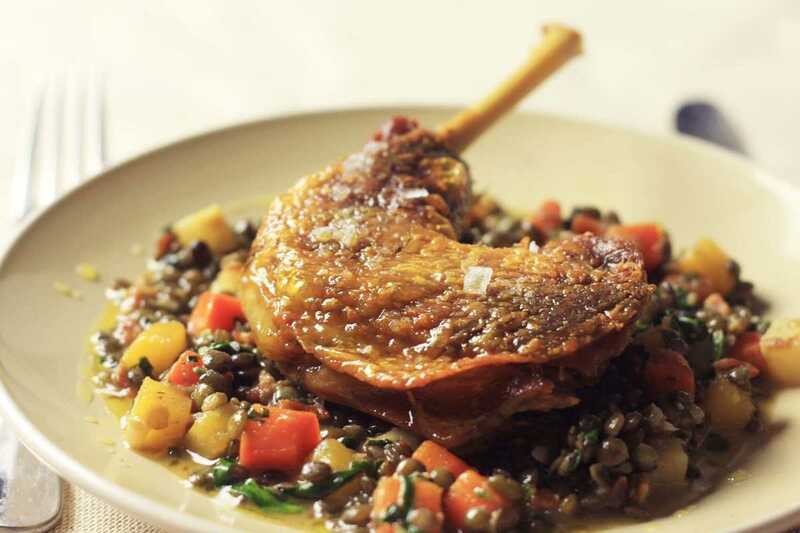 Get the confit legs out of the fat, and scrape off any excess. Fry them in a hot pan skin side down, pressing to flatten slightly, then place in the centre of the oven for about 20 minutes, until the skin is crispy and the meat is heated through. When the lentils are ready, drain off and reserve the stock, then add the vegetables and bacon. Finely chop the garlic and parsley and add to the pot. Add a ladleful of the stock, along with a knob of butter and a drizzle of vinegar. Season to taste with salt.